Yesterday was Fat Tuesday. I largely let it slip past without observation this year, which is kind of unlike me – I’m not one to overlook any excuse to relax and do a little good-natured partying. Granted, Mardi Gras isn’t exactly a core tradition to someone mostly German and Scotch-Irish, but, hey, I’d celebrate Guy Fawkes Day if there was even a tenuous excuse to have a few beers. Case in point: If I recall correctly, I made a big deal out of Cinco de Mayo a couple of years ago. For the record, it’s not like my life has been affected greatly by who won or lost the Battle of Puebla in 1862, but that hasn’t stopped me from making margaritas and dancing around under an oversized sombrero. Anyway, because I’m old and lame, and it’s been a busy week, I skipped the Fat Tuesday revelry and instead spent the evening watching Downton Abby. Yeah, that’s right, I rock that hard. Nothing says party like kicking it with a PBS English period series. Of course, if yesterday was Shrove Tuesday, that means today is Ash Wednesday. First admission: I’m Catholic. Second admission: I’m not really a to-the-letter-of-Roman-policy Catholic. Still, I am better about observing certain practices today than I was in my wild and crazy youth. 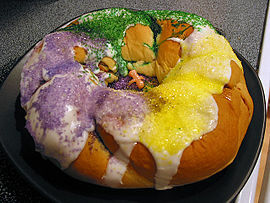 Back in The Day, I’d roll in to work with an ugly Fat Tuesday hangover – likely still absent-mindedly wearing a string of beads or two – and be dumbfounded by the dark ashes adorning many of my coworkers. I do live in the greater Cincinnati area, mind you, which I’m pretty sure has more practicing Catholic folks per capita than just about any other city on Earth outside of the Vatican itself*. At any rate, in those days, once I realized the ashy forehead crosses weren’t some new-fangled body art fad, like, um, earrings and, uh, the tattoos all the kids were getting, I’d acknowledge the beginning of the Lenten season by spending 0.723 seconds considering whether I’d give anything up. The answer was almost universally no. It’s not that I was just being contrary and refused to participate as the basis of some kind of personal crusade or anything. It takes much too much time, energy, and passion for even that sort of activism, if you ask me. Truth is, I’ve just never really seen the point. Exactly how does giving up, I don’t know, pepperoni pizza, or coffee, or crack smoking** prepare me for the upcoming Easter season? I do have to admit that it’s a pretty timely thing, though. Just as everyone has officially thrown in the old white towel on those New Year’s resolutions to get fit, quit smoking, or stop parading around the neighborhood in a full Nell Carter costume at 3 am, here’s this brand spanking new opportunity to make some a sacrifice and better ourselves. So if you’re down on yourself for giving in already, you’ve got a clean slate and another shot. To me, though it seems like there are other, better ways I could be more serious about Easter. Like maybe by being a better person all the way around; be slower to anger, quicker to forgive, less judgmental, more accepting. So tell me, are you giving up something for Lent this year? Me, I just made up my mind. I’m giving up being a jerk. Man, it’s going to be a long 40 days. *Almost certainly not true at all. I make facts up to suit me, as needed. **Just kidding. Obviously that’d be a good first step for Easter.